When I redecorated my kitchen I also changed some of my kitchen accessories. Some so they would co-ordinate with my new look, others because I had been making do and they were not particularly functioning well. I had a lovely set of designer glass storage jars which were very decorative, but from a practical point they no longer had an air tight seal. For me if an item is out on display it needs to be stylish and both practical and functional. Are looking for kitchen accessory inspiration that adds both function and form to your kitchen? 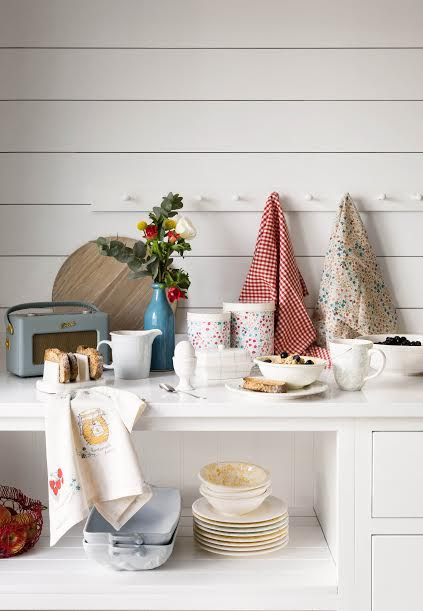 Here are some of my favourite Kitchen Accessories currently available at House of Fraser. Every one needs a tray at some point. Not only is this practical but it looks stylish too, perfect for setting up your kettle, teapot and sugar bowl on. Then when guests arrive use to carry your drinks through to the garden on a Summers day. Choose from muted colours or something a little more funky for your kitchen. Kitchen Utensil sets do not have to be black. This set of Joseph Joseph utensils combine wood and colourful heat resistant silicone handles to add a little colour to your kitchen. Kitchen Roll Holders range from plain and functional to positively works of art. A practical jar that you can easily see just how full it is. I store muesli, granola, bran flakes and raisins in my glass jars, my doesn't that make me sound healthy! 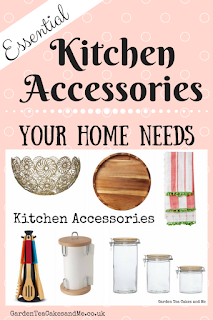 Do you have an essential kitchen accessory you can not live without?